Jiwa Damai encourages a combination of theory and hands on practice in a supportive environment as an important approach to learning and growing. Our internships offer the possibility to design and actualize a project, either as a group or on an individual basis. Our interns receive expert support and guidance while being given the chance to take responsibility for their own learning outcomes. At this time we are offering places for up to 6 interns to take part in a one-off group permaculture, aquaculture design project, facilitated by our in-house permaculture design trainer Stephanie Garvin. The project will involve designing and implementing an aquaculture project, including building a chinampa system, a technique used in Latin America by the Incas to successfully grow food in wetland areas. 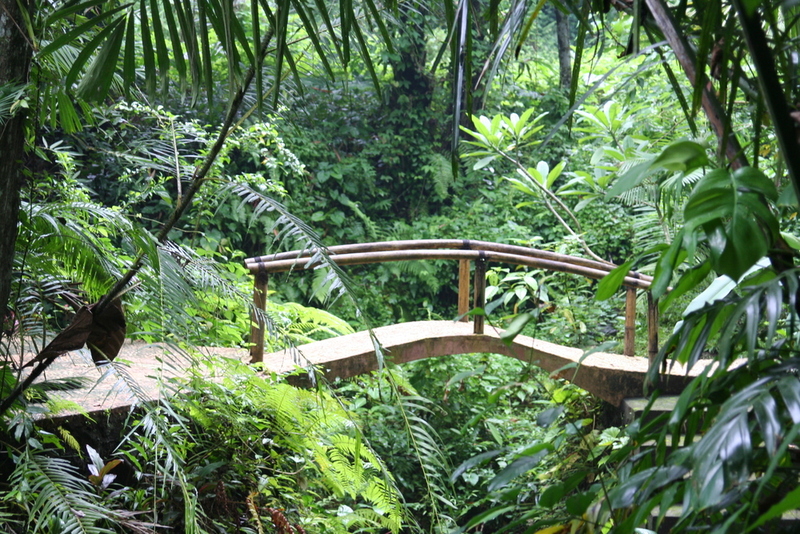 We have several swamp areas at Jiwa Damai which lend themselves ideally for such a project. To our knowledge it is the first of its kind to be implemented in Bali. It is an exciting pilot project. This project includes free theory sessions on permaculture design for chinampa systems. Our offering The Art of Learning by Doing is open for people interested in permaculture, sustainable food production and environmental conservation. No previous permaculture knowledge or experience is needed. We also invite Permaculture Design Certificate holders desiring to expand their practical knowledge and design skills. Participants need to be in good health and physical condition since the project will involve manual work in a tropical environment. For more details or information, or to apply for a place on this internship programme, please contact us at info@jiwadamai.net or using the contact form attached. Optional Extras We can provide on-site, basic accommodation and meals at Jiwa Damai Retreat Centre and Organic Garden at a discounted rate. 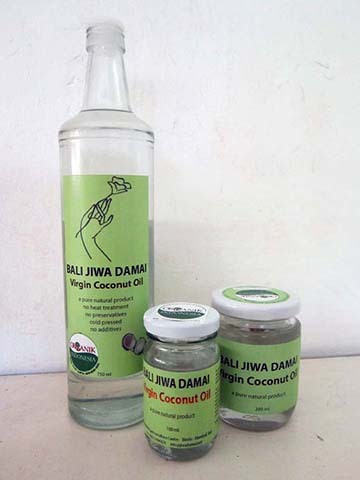 When I arrived at Jiwa Damai as an intern, I had to organize the production of the Coconut House. A very interesting and exciting project that I enjoyed doing with the help of Margret and Libby. The production begins with Nyoman and Ketut opening the coconuts in the tropical garden.The coconut meat is extracted before being transformed in flakes with a grinder. Inside, in a green atmosphere, fruits are drying while the filtering process of oil is done by hand. Empty jars and glass bottles are ready to package the delicious virgin coconut oil. You can use it on your skin or for cooking. It is a really healthy food with lots of benefits. I had the pleasure to enjoy it in the delicious Balinese meals that are prepared by Made. Finished products are then nicely put together in the small shop of Jiwa Damai and other outlets. ... from our international friends. Our two wonderful volunteers, Laia from Spain Catalan, and Aitor form Equator are engaging in garden work, using the Balinese sickles to clean an area from Tapioka. Tapioka is eaten as a vegetable, prepared with grated coconut meat. Thank you for your contribution to Jiwa Damai! When ripe, the skin of the fruit turns a more orange color. This is a fresh cacao fruit, picked right off the tree. After harvesting, we dry the fresh beans. The essence of chocolate are contained in these air dried beans, picked fresh from our organic garden. Packed with very important minerals such as magnesium and iron, the health benefits of raw cacao are immense. Enjoy them on their own or ground with a little brown sugar, they are a perfect addition to any dessert.